Beautiful territorial custom built home on 2.5 acres situated in Cave Creek, AZ. Private courtyard entry w/rustic wrought iron gate into western-style home that offers split floor plan, two master suites, 5 beds, 4.5 baths, HUGE home office, 4,230 SF, 3 car garage, RV gate and parking w/electrical hook-up. Resort backyard w/fenced-in private pebble tec play pool, elevated heated spa w/endless mountain views of Cave Creek Regional Park. Entertainer's dream home w/spacious great room, gas fireplace, custom Vega poles, gorgeous stacked stone, unique niches, lighted accent shelves, and tons of updated elements. Stunning master suite has walk-in closet w/hickory wood flooring and a private backyard exit. Master bath w/double sinks, walk-in snail shower, and huge garden soaking tub. Second... master bedroom has en-suite bath, walk-in closet, and access to backyard. Secondary baths have NEW granite tops and under-mount sinks. HUGE home office has built-in desks, cabinets, and shelves. Laundry room has utility sink and folding counter space w/attached cabinetry. Fresh ext/int paint throughout home. Fabulous backyard has upper deck patio w/built-in NEW gas BBQ and sink, extended covered patio, and side yard w/gate - great for dogs. Step down into large yard w/fenced-in private pebble tec play pool w/cantilevered flagstone edge, elevated spa area, outdoor fireplace, RV gate, RV parking & RV electric hook-up. Oversized 3 car garage has double and single garage doors, attached cabinetry, and work space area. 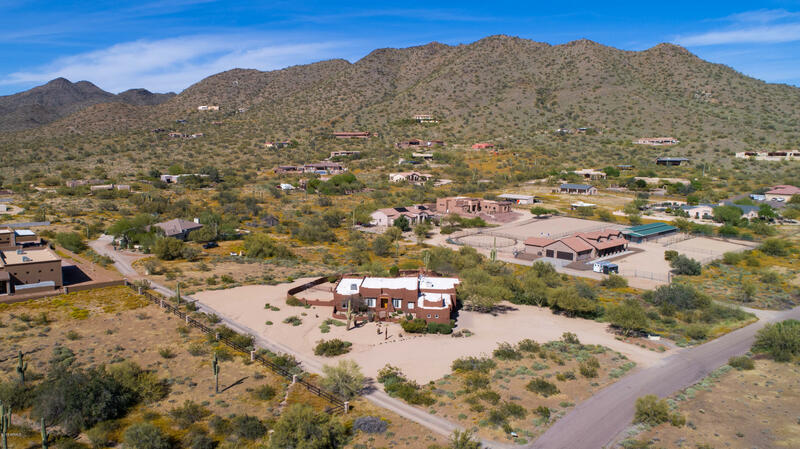 Super LOCATION near Cave Creek Regional Park.